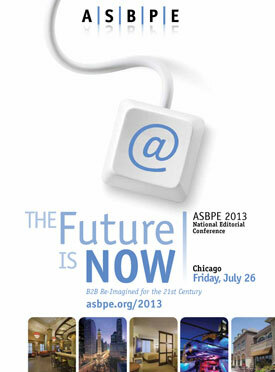 The 2013 ASBPE National Conference will be held July 26 in Chicago. Register now or download the conference brochure (PDF). In addition, the conference program will include roundtable discussions on raising brand awareness and copyright law in the digital age, as well as Magazine-of-the-Year and Website-of-the-Year Case Studies by the winners (to be announced). Click here to register now! Or download the conference brochure here as a PDF. The 2013 ASBPE National Editorial Conference will be followed on the evening of Friday, July 26, by the 2013 Azbee Awards of Excellence banquet, to take place at the Grotto in Oak Brook, Ill. (a suburb of Chicago). The Azbee Awards is one of the most competitive contests for B2B, trade, association and professional publications. It recognizes outstanding work by magazines, newsletters and digital media: websites, e-newsletters, digital magazines and blogs. The competition is open to all U.S.-based publications. Specialty award categories of competition include Magazine of the Year, Web site of the Year and Multi-Platform Presentation of the Year. During the banquet, recipients of the 2013 Young Leaders Scholarship, for editors age 30 and younger, also will be announced. In addition, ASBPE will present its 2013 Lifetime Achievement Award to Julia Homer, former founding editor of CFO magazine, who will speak at the event. Another highlight of the ASBPE awards program is the Stephen Barr Award, which is given to the writer of the top-judged feature story from the competition. This year will be the tenth annual presentation of the Stephen Barr Award, endowed by the family of Stephen Barr — a gifted business-to-business reporter who died in 2002, at the age of 43. Awarded through the not-for-profit ASBPE Foundation, the award is presented at the end of the award ceremony. For more information or to register for the 2013 ASBPE National Editorial Conference and/or Azbee Awards of Excellence, please visit www.asbpe.org. Download the conference brochure here as a PDF! Or Click here to register now! Special thanks to PixelMags for sponsoring the 2013 conference! Founded in 1964 as the American Society of Business Press Editors, ASBPE is the professional association for full-time and freelance editors, writers, art directors, and designers employed in the business, trade, and specialty press. The official name was changed to the American Society of Business Publication Editors in 1997 and to ASBPE in 2012. ASBPE has chapters in cities nationwide, including Chicago, Boston, New York, Kansas City, Cleveland and Washington, D.C.